Discover the beauty beneath your skin at the brand-new and all-immersive BODY WORLDS London Museum Experience. The original display of real human bodies finally has a permanent home in the heart of the city at the iconic London Pavilion, 1 Piccadilly Circus. Dr Gunther von Hagens’ renowned exhibition of real human bodies have sparked curiosity and awe around the world with over 45 million visitors globally. Over 200 anatomical specimens reveal the magic and mysteries that lie underneath the skin using a wide-range insights into our body and mind which show the effect lifestyle choices have on our health. Expect a unique, exciting and interactive journey through the human body, described by many as ‘emotional’, ‘extraordinary’ and even ‘life-changing’. 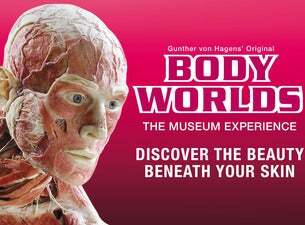 A world-class Museum Experience for all ages, visit BODY WORLDS London to understand what it means to be human. Cancellation Policy: No refunds or exchanges after booking.